When Karen of If I Could Escape moved back to the UK in 2010, Kirsten of Gone Bananas and I began fantasizing over all the yummy British foods she would soon be savoring. As we dreamingly drooled over tasty British treats, Karen began to get a bit melancholy for the food she would be missing here in the States. 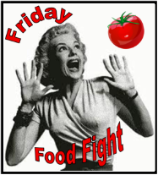 Once we wiped the drool off our chins, the three of us concocted a clever way to tease share all our favorite foods and that is how we our Friday Food Fight began. Now, a few years later since we first began flinging all those foodie photos at one another, life has served up some new tasty adventures for Karen and Kirsten, however, I continue tossing delicious dishes at my readers by sharing our family’s favorite recipes. Below are some the recipes I’ve featured in my weekly Friday Food Fight. Hey! Just wanted to say great blog. Keep up the good work! This is fun. I want to join in I have never done a meme that has something to do with food and I love food and eating, yum! Oh my goodness! This sounds like so much fun. I’ll be sure to link up this Friday. I’m here, now to figure just what kind of food to post.